Illegal miners block a road at Konawaruk after police and GGMC officers moved into to stop them from extracting gold from a concession awarded to Tesouro Resources. Police Friday managed to quell unrest by illegal gold miners at Konawaruk after police and mines officers ordered them to stop extracting the precious metal at concessions owned by Tesouro Resources. 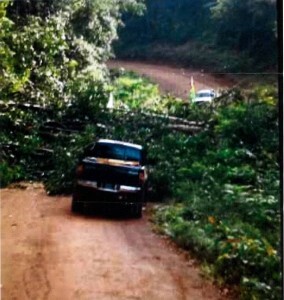 The illegal miners had cut down trees and blocked a road at Konawaruk to prevent the entry and exit of vehicles and supplies to legal operations in the area. Efforts by the Guyana Police Force, Guyana Geology and Mines Commission (GGMC) and Tesouro on February 18, 2016 to remove three illegal operations failed and escalated into alleged threats to kill two named company officials. ” The raiders were adamant that they will not move nor will they be removed, irrespective of who owns the mining property. During the conduct of the operation, the raiders issued several threats in the presence of the police,” the company stated in a report. The company alleged that the “raiders” have threatened to burn buildings belonging to Tesouro Resources if they are not allowed to mine for gold. The company wants police and GGMC officers to maintain a presence at Mowasi and North Folk to ensure the “raiders” do not resume illegal mining or protest action.